- Publisher As life's struggles challenge our faith, truths known in our minds can become questions in our hearts. In this in-depth Bible study for women, Kirkie Morrissey addresses life's big spiritual questions and helps us look to God and His Word for the answers. You'll search the Scriptures for yourself and find the hope you're looking for. Each chapter includes relevant Scripture references, personal reflection questions, group discussion questions, and insights from great authors. sBring your questions to God as you study God, Where Are You? You'll find victory, comfort, hope, and faith -- even in the midst of dark times. Book jacket. 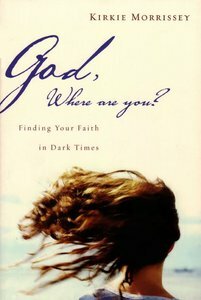 About "God, Where Are You?" As life's struggles challenge our faith, truths known in our minds can become questions in our hearts. In this in-depth Bible study for women, Kirkie Morrissey addresses life's big spiritual questions and helps us look to God and His Word for the answers. You'll search the Scriptures for yourself and find the hope you're looking for. Each chapter includes relevant Scripture references, personal reflection questions, group discussion questions, and insights from great authors. sBring your questions to God as you study God, Where Are You? You'll find victory, comfort, hope, and faith -- even in the midst of dark times. Book jacket. Morrissey speaks at both local and national conferences and also teaches a class at her church. She writes newsletter articles for several ministry organizations. Even though her manner is gentle, she speaks powerfully.